Originally published in Kush Magazine. Live painters from across the U.S. working on a collaborative mural at Sonic Bloom Festival 2010. “The Mile High City,” Denver has developed something of a reputation as a mythic city on the hill, a holy mountain where musicians flock to the sweet nectar of the scene and the “green rush” of medical marijuana has opened the possibility for a new culture of arts patronage. 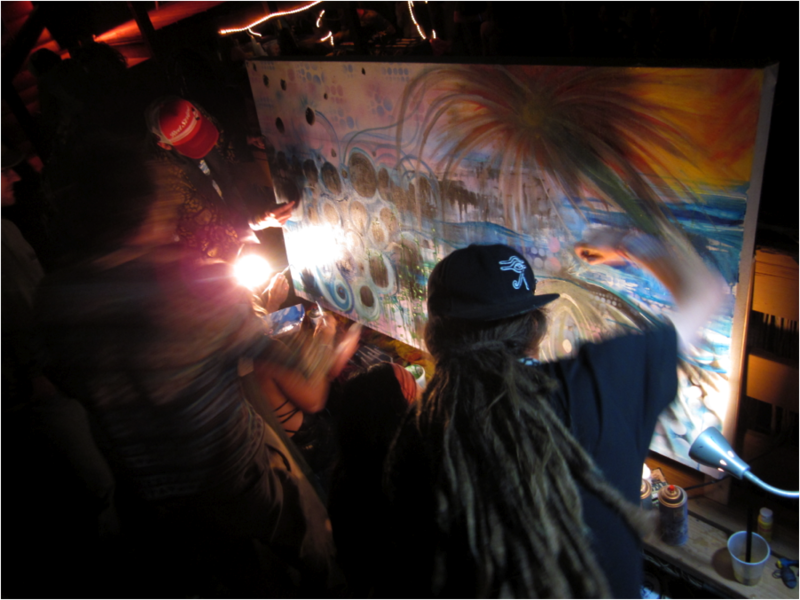 But the rarefied air of America’s new cannabis capitol is also atmosphere to the historical epicenter of another progressive movement: live painting. 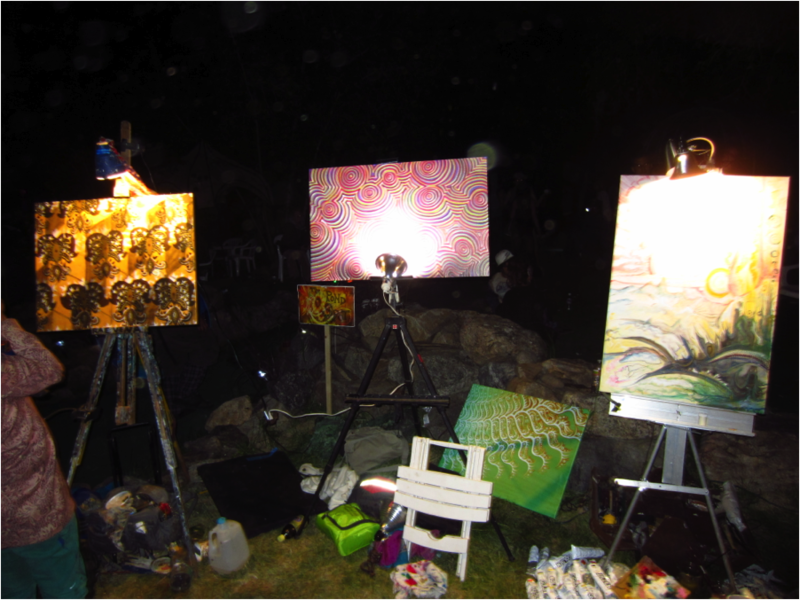 Painting as a performance, usually as accompaniment to live bands or electronic musicians, has exploded in recent years as a symptom of the evolution from the concert as a spectator sport to entertainment events as participatory multimedia environments. Part of a re-tribalization of culture enabled by border-breaking electronic communication, this new breed of concert encourages dancers, video artists, and installation designers to collaborate on fully immersive spaces that transport attendees from the mundane world outside to mini-festivals where the overwhelming display of creativity triggers a sympathetic response. The internet world where an increasing slice of society resides is highly interactive, responsive, and tactile compared to television or print…and consequently, people are starting to demand more from these older media. 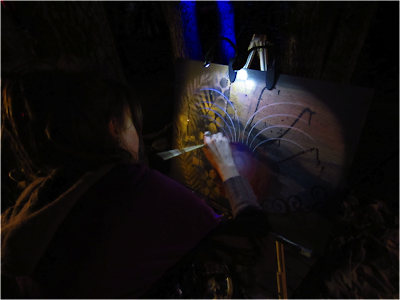 Live painting – which destroys the ancient stereotype of artist-as-solitary-magician by planting the studio amidst reveling crowds and integrating real-time feedback from the audience – is an idea whose time has come. And it finds a natural home in Denver, where the music – be it jam bands, bluegrass, or electronica – has always been about making parties happen. There are many excellent live painters in the accelerated cultures of San Francisco, Los Angeles, and New York, as well as fringey college towns like Austin and Asheville. But some of the Denver area’s landmark venues have famously supported a multi-generational live art culture that took the art from the sideshow amusement it was in the days of “Speed Painter Denny Dent” to the international movement coalescing today. Chaeli Cardenas, Michael Garfield, and Kevin Odenedo painting together at Red Rocks for Sound Tribe Sector Nine, September 2011. 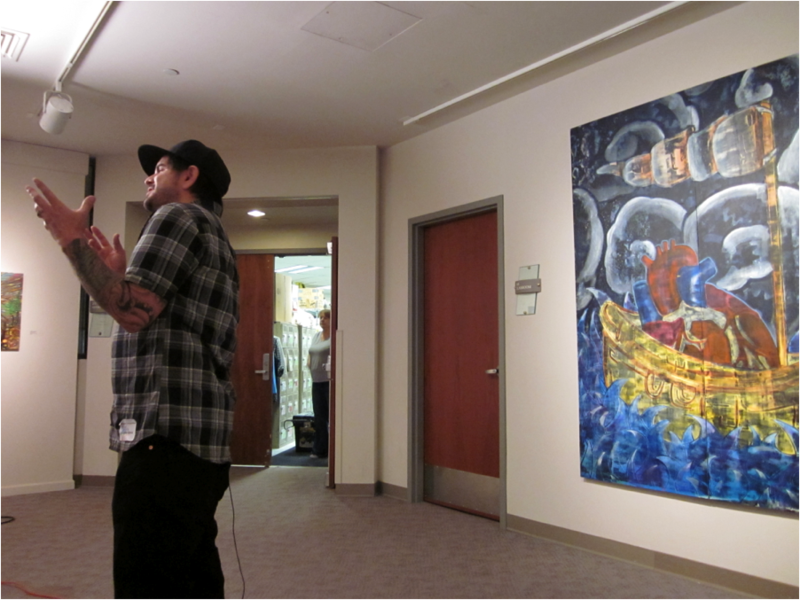 The momentum of this movement was obvious when documentary camera crews descended on the Arvada Art Center last year, after community elder Keith “Scramble” Campbell organized an historic marriage of live painting’s rascally outsider culture with the institution of fine art. There is no one better than Scramble to do so – the man spent decades introducing people to the art form as the resident artist of the legendary Red Rocks Amphitheatre just outside of town. It was at Red Rocks that I was first inspired to paint at concerts, watching Kris D paint with touring instrumental electronic band Sound Tribe Sector Nine. I am one of many. 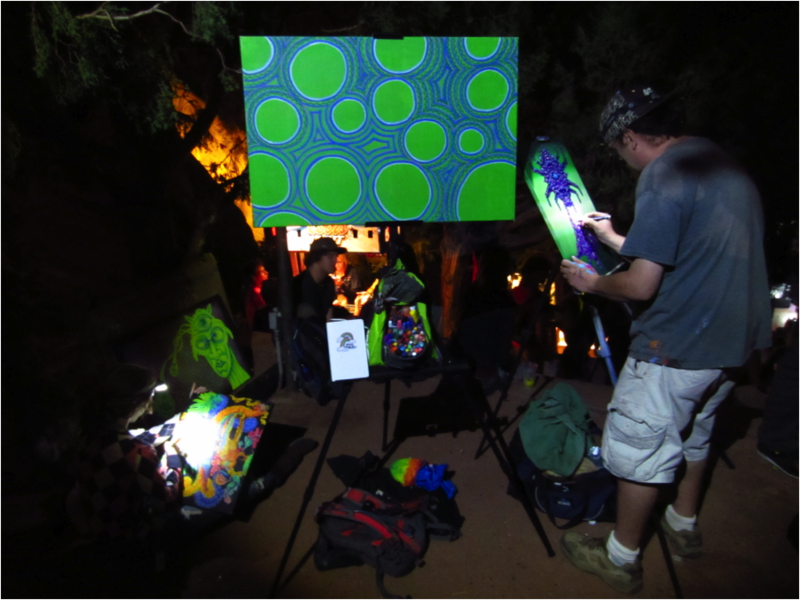 And four years later to the day, I found myself painting at Red Rocks, inspiring an even newer generation of live artists. Live artist J Garcia speaks to the Film Cartel documentary crew at the Arvada Center in 2010. Their new movie about live painting, ScrambleVision, will debut in the 2012 film festival season. 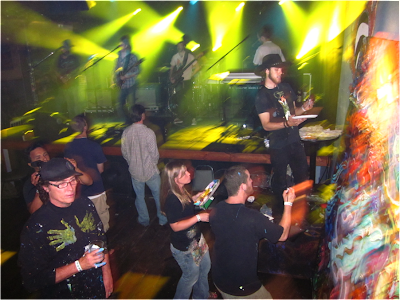 Rae Vena, Michael Garfield, and Warren Binder were just three of over a dozen live artists at Sonic Bloom Festival 2011. Cervantes in particular has kept an open-door policy for local and national artists who want to contribute their talents to the commons. 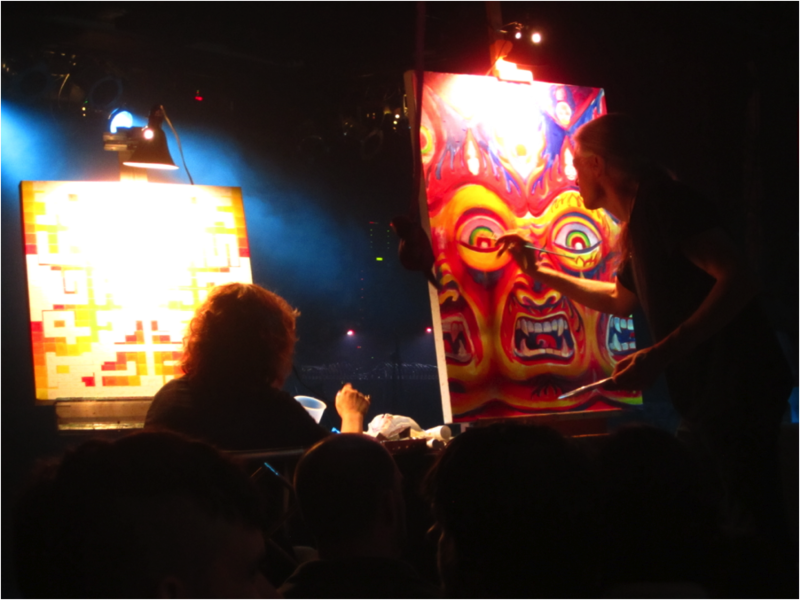 Live art events like “Thunk,” organized by Scramble and Bükaty, brought artists from across the U.S. – movement founders like Los Angeles’ Norton Wisdom and New Orleans’ Frenchy – to collaborate on massive indoor and outdoor murals. Throughout the year, Sonic Bloom holds parties that routinely draw nearly a dozen live painters into the 600-person house. The walls proudly display art created on site, and the mythical lost Welton Street Mural – one of the largest live art collaborations ever – is hidden beneath beige paint outside, cultural catastrophe at the command of a building owner who didn’t get it. Left to right, live painters Scramble Campbell, Lauri Keener, Dylan Brooks, and Patrick Beery converge on Quixote’s True Blue in Denver for “Thunk,” a multi-generational celebration of painting to music. The area has made such a name for itself as a haven for live art that deeper forces must be responsible, “something in the water.” Live painters Amanda Sage and Andrew “Android” Jones grew up in Boulder, mere miles from the home of legendary visionary artists Robert Venosa and Martina Hoffmann…connecting the region’s independent western attitude through the Viennese “Fantastic Realists” to a centuries-old tradition of mastery. Martina Hoffmann and her husband, the late Robert Venosa, at work on a collaborative live painting at The Mishawaka Amphitheatre in 2010. Between the noble European tradition and more contemporary graffiti culture, it exerts an undeniable pull. For an entire subculture of nomadic live artists who follow concerts like the native peoples of this land once followed the buffalo, Denver is an important stopping point on the annual festival circuit. For other more stationary artists across the country, it has become a kind of live art Mecca. Nationally-acclaimed live painter Jason Garcia moved here from the Bay Area around the same time as an influx of new blood from Kansas, Texas, Wisconsin, Illinois, Ohio, and Virginia. It is a palpable tide of creativity taking shape. 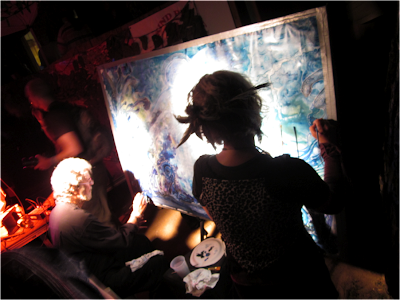 Internationally-touring visionary artists Alex & Allyson Grey painting at Cervantes Masterpiece Ballroom in April 2011. ChelseaLyn Graber painting live at Sonic Bloom 2011.